Medication compliance – taking the right medications, at the right time and with the right dosage is crucial for your health and safety. 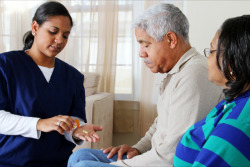 At Western Slope in Home Care, we understand that forgetfulness that comes with old age or disease and other circumstances may prevent our clients from taking their medications on time. This is where our caregivers can help. Feel free to get in touch with us at 1-855-204-0369 / 970-878-7008 for more details. You can also Set an Appointment now.